By Ramin Djawadi. Arranged by Chrissy Ricker. Sheet Music Single. 4 pages. Published by Chrissy Ricker (H0.548957-224461). 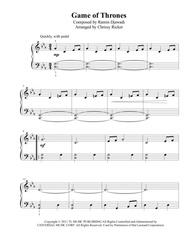 This is an "easy piano" (level 3-4 of most piano method books) arrangement of the main theme from "Game of Thrones." This arrangement contains the complete theme in the original key. Need an easier arrangement? 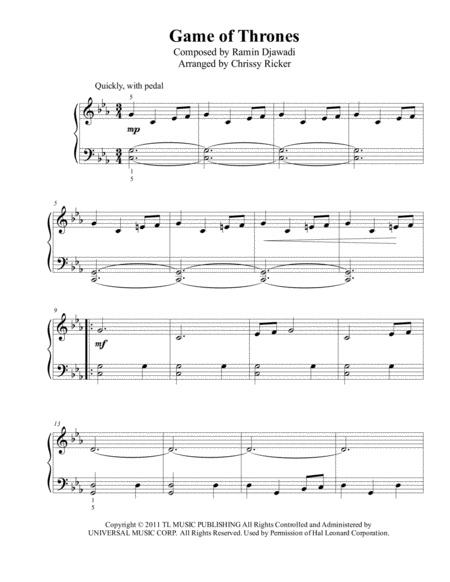 Check out my version for "beginner/big note" piano (levels 1-2).